24/7 Heavyweight Mid- Back Intensive Use Chair is designed to stand up to even the toughest work environments such as call Homeland Security Guard Centers, 911 Call Centers, 911 Dispatch Centers & Industrial, where heavy duty 24/7 usage is required. Constructed with an indestructible ten-gauge all steel frame and built to hold up to 550 lbs. Chair comes included with Dymetrol Suspension which is a bouyant stretch "floating-on-air" suspension that cushions torso with optimal tension. This prevents spine compression; bounces back instantly when weight is lifted; and has no springs to squeak. Other features include an ergonomic knee tilt control, tilt mechanism position lock, lumbar support, and a 6 year 24/7 intensive use written warranty. 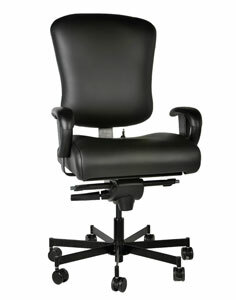 Back Height (Seat to Bottom of Headrest): 25"
7 Height positions and 2- inches of width adjustments. Arms fold back neatly to permit the user to slide under the desk or workstation. Great for all fabric selections, especially leather. 7 Height positions and 2-inches of width adjustment for each arm. A 100 % Corduro Nylon Seating fabric with a small-scale pattern effect. A high performance product that is appropriate for even the more demanding end-use applications. A well-rounded color line including the volume classics as as some vibrant accents. A dependable solution when stringent abrasion requirements are specified. Wears like iron, helps control odor and is great with stains. . Highly durable 100% nylon fabric has a very tight weave, makes this the perfect fabric if the occupant will be wearing a duty belt. Treated with Teflon stain control.